Education Station: What’s Up with Whole Roasted Beans? You’re curious, so we find answers. Our education team fields lots of questions from our guests during classes, so we’ve decided to launch a series of monthly installments in which we tackle some of those questions and share the answers with the world. We call it The Education Station. This week, Robert addresses some questions about a product we sell in our cafes, and what to do with them. 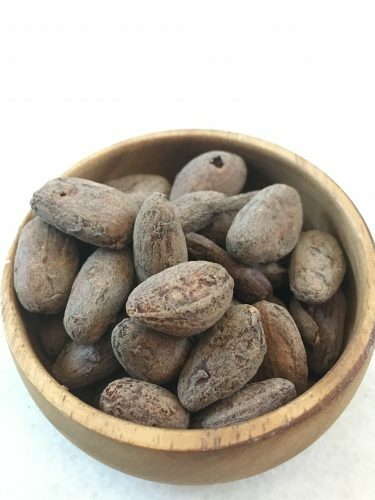 At Dandelion Chocolate, most people know us for our chocolate bars, drinks, and pastries, but the one item our customers seem to be most curious about lately are whole roasted beans. We sell bags of them in our cafés, and after spending most of my time working at the Ferry Building as a cafe associate, I’ve heard a lot of questions about them: “Are those coffee beans?” or “Is that where chocolate comes from?” and of course, “What do I do with them?” Well, now is the time to grab a bag and come along to dehusk that question. To start, Whole Roasted Beans (or as we often abbreviate, WRB) are cocoa beans. Yes, these are what we use to make chocolate. So nope, they are not coffee beans. After we finish hand sorting all of our beans—picking out the cracked, flat, and broken ones that might not taste good—we roast them, and then we crack, winnow and grind them down with sugar into chocolate. Roasting is a very important step in our flavor development process for two reasons: One, it helps bring out the flavors that we love in our chocolate and two, it’s the ‘kill step’ that ultimately kills any possible pathogens and assures that our chocolate is safe to eat. 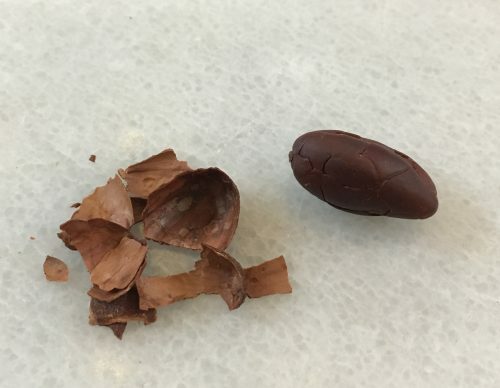 For our WRB, we use Madagascan beans from Bertil Akesson’s Bejofo Estate, and roast them a bit longer than we do if we were making them into chocolate. Why? The answer is simple. When roasted lightly, our Madagascar beans have the bright flavors we think taste amazing as a chocolate bar (after they’ve been conched and sugar has been added) but we don’t necessarily love those flavors as much as a stand-alone experience. So, by increasing our roast time, we’ve been able to skim off some of the sharper acidic flavors, leaving us with a nutty, citrusy flavor profile that we think is more snackable. If you want to learn more about the roasting process for our beans, we have factory tours and classes available to answer any questions you may have. So, how do I eat them? One way people eat them is as a snack! You can squeeze one lightly and roll it between your fingers, just like cracking a peanut, to snap the skin and make it easier to peel off. You’ll end up with two parts; a peel, which we call husk, and the solids inside or the “meat of the bean,” which we call the nib. The nibs are what we refine down to make chocolate. This is the closest thing to eating 100% chocolate without the commitment. I often taste nutty notes in pure nibs, similar to a peanut or almond. Using the nibs as a topping is always my favorite way to enjoy them. I like to have the crunchy texture and nibby flavor that it adds to things I already love. You can sprinkle the full nibs on top of yogurt, oatmeal, a salad or even ice cream! If you feel like getting creative, many people candy their nibs and use them as a delicious topping for desserts. 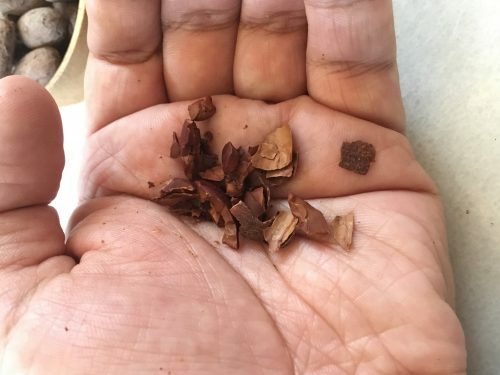 Not only can you eat them as broken chunks of nib, but you can grind them up in a blender or food processor to make a nutty powder to boost your recipes. I suggest trying matcha soft serve, covered in ground nibs – yum! Baking with chocolate is always fun, but with nibs, it’s even better! My favorite is making chocolate cherry bread using nibs instead of chocolate chips. Roasted cacao beans also make a great substitute for nuts. You can easily make banana nut bread by replacing nuts for nibs. We use nibs in many of our recipes here at Dandelion, stop by either of our cafes to try how our kitchen team incorporates them into our pastries and drinks. Although it’s possible, I wouldn’t recommend using these bean for home chocolate making. As I mentioned before, we developed a very specific roast profile that is intentionally different from the one we use for our bars, so we would hate for you to not get the result you wanted. If you’re interested in making chocolate at home we have a book coming out in November where we go more in depth, but if you can’t wait, sign up for our Chocolate 201 classes and let’s make a batch of chocolate! Are there any other experiments I can do with them? Absolutely! The great thing about working at Dandelion Chocolate is all of the tasting and experiments we do here—from our chocolate makers developing new bar profiles to our pastry team regularly adding new things to the menu. 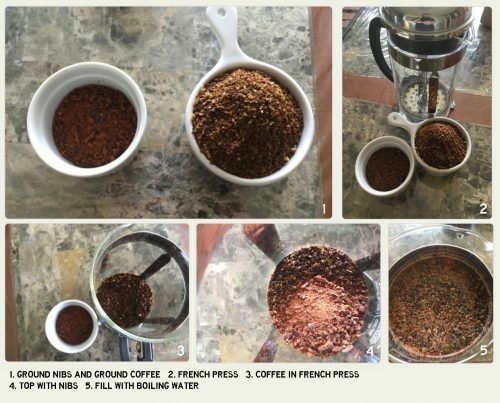 Everyone works hard in learning and creating something they’re excited about, so I wanted to share a couple of things that I made at home using my roasted beans. If you want a quick, but slightly messy way to remove the husk off the beans, this has worked since the beginning of our chocolate journey. This is the same technique our founder, Todd, used when he was starting in his kitchen at home. Put your desired amount of beans into a ziplock bag and make sure it’s closed all the way. 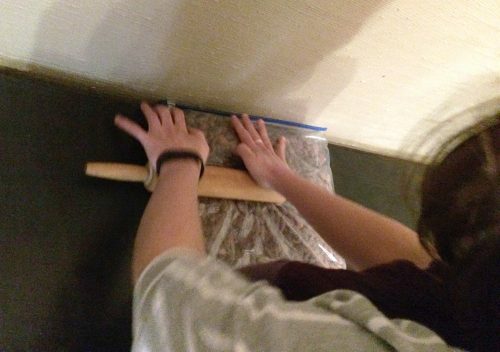 Using a rolling pin to go over the bag and break all of the beans. What you will have in the bag is a bunch of broken husk and nibs, all mixed together. Place all of the broken nibs and husk into a bowl. I found that using a strainer helped me filter out some of the bigger pieces of husk before putting in the bowl. 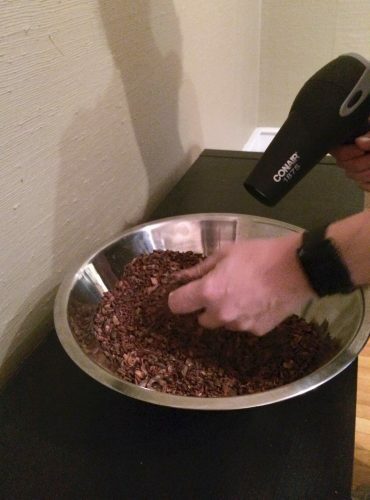 Then use a blow dryer to “winnow” the husk off the nibs. Since husk pieces are light, they should blow away and the nibs should remain in the bowl. This takes a little practice of angling the blow dryer just right to allow only the husk to fly over the edge of the bowl, while the heavier nibs remain inside. As a warning, make sure you do not do this in a place where pets could eat them. Theobromine is very, very dangerous for dogs! If you’re like me, and like things done at 110%, you can remove any remaining husk by hand. In our factory, we use the ten-minute rule: once you start picking nibs clean, cap yourself at ten minutes. Otherwise, you’ll be doing it for eternity. I also tried seeing how long it would take me to remove the husk by hand, bean by bean, and got through half of the bag before my hands were covered in cocoa butter and smelled like chocolate. It’s not impossible, but requires more patience, a lot of podcasts, and may take longer than cracking and winnowing. After spending some time working at the Ferry Building one of my favorite things to do was to make our Ecuador Cold Brew. So I went home and made some for myself in a French press. Start off by grinding your coffee at a coarse grind. Optional: Use a spice grinder. I tried to match the same coarseness as the coffee. Pour the coffee into the French press first and then fill it about halfway full with boiling water. Next, add the nibs and stir everything together before topping it off with more water. Remember to put the lid on, but don’t plunge it. Leave it to brew at room temperature for 24 hours. Plunge the coffee, and do it slowly so none of the grounds make it to your coffee. Transfer to a jar and put it in the fridge to enjoy later. This was probably the most exciting thing I got to do. I bought a cast iron waffle maker and was finally able to put it to use. If you were wondering, this is where I used those nibs I winnowed by hand! Combine all of the dry ingredients into a bowl. In another bowl, mix the eggs, buttermilk, melted butter and vanilla. Brush each side of the waffle maker with sunflower oil, or another neutral oil. Pour 1/2 cup of batter into the pan for each waffle. Cook for 2 to 3 minutes, until golden and crispy at the edges. You can use maple syrup if you like, but I used strawberries as toppings since I wanted to really taste the nibs. I love incorporating roasted beans into my overall diet, especially if I want to cut out sugar for a bit. The possibilities are endless, and if you ever see me at an event or class I would love to hear how you used your beans. Or comment your favorite ways below! Remember there’s no right or wrong way to taste chocolate, so I hoped this helped answer some of your questions. There are lots more experiments that I wanted to try, like smoothies and candied nibs, so keep an eye out for another post soon.